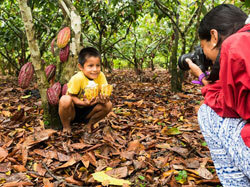 In the end of July 5 of FairMail’s teenage photographers set off for a 10 day photography trip to the Peruvian Amazon. Together with 6 photo fanatics from the USA, Italy, Germany and the Netherlands they followed the “Cacao Route” learning all about the cultivation, harvesting and processing of cacao. Besides taking amazing cacao photos for our stock photography clients they also worked hard on images for FairMail’s new greeting card collection. On the 8th of October we are organizing an information session for those interested in coming along with us during one of the next trips. Read more here.